Still from Codebreaker showing Turing’s checkout of three Carroll books. The charming town of Guildford, 40 minutes southwest of London on South West Trains, is associated with two famous British logician-mathematicians. Alan Turing (on whom I seem to perseverate) spent time there after 1927, when his parents purchased a home at 22 Ennismore Avenue just outside the Guildford town center. 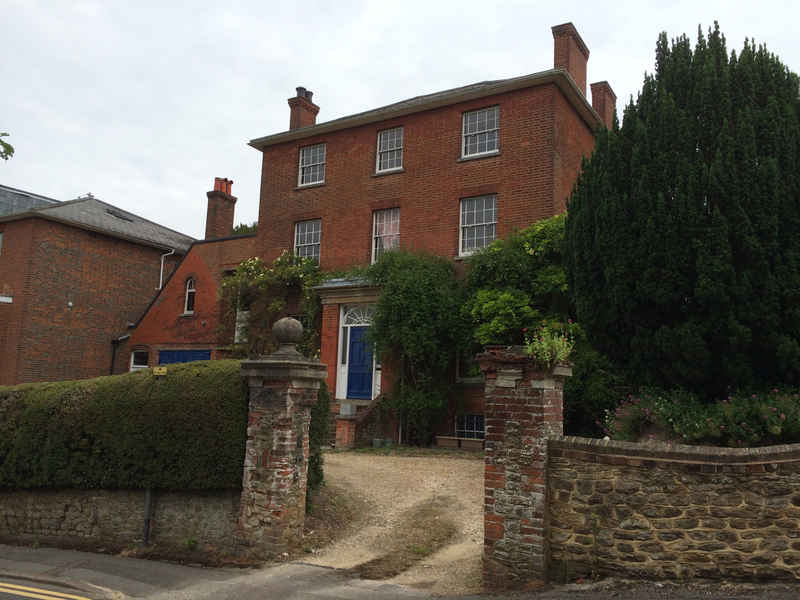 Although away at his boarding school, the Sherborne School in Dorset, which he attended from 1926 to 1931, Turing spent school holidays at the family home in Guildford. The house bears a blue plaque commemorating the connection with Turing, the “founder of computer science” as it aptly describes him, which you can see in the photo at right, taken on a pilgrimage I took this past June. And this brings us to the second famous Guildford mathematician, who it turns out Turing was reading while at Sherborne. In the Turing docudrama Codebreaker, one of Turing’s biographers David Leavitt visits Sherborne and displays the huge ledger used for the handwritten circulation records of the Sherborne School library. 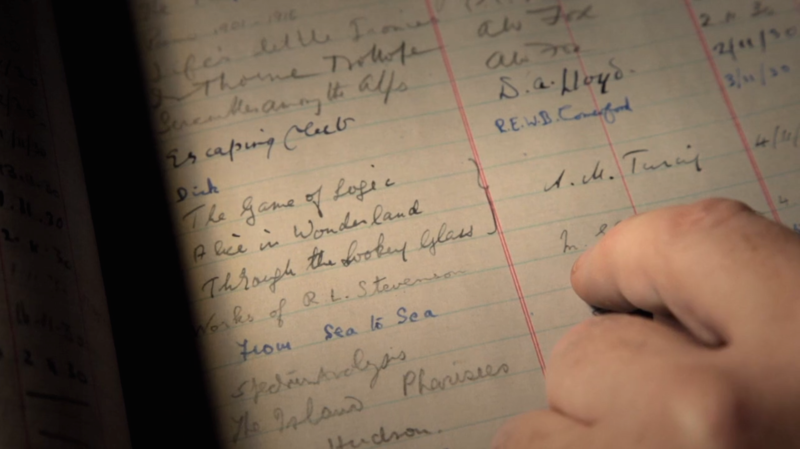 There (Leavitt remarks), in an entry dated 11 April 1930, Turing has checked out three books, including Alice in Wonderland and Through the Looking Glass, and What Alice Found There. (We’ll come back to the third book shortly.) The books were, of course, written by the Oxford mathematics don Charles Lutwidge Dodgson under his better known pen name Lewis Carroll. 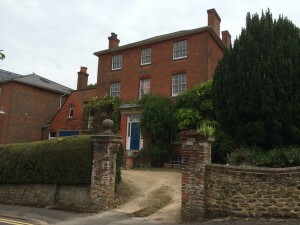 Between the 1865 and 1871 publications of these his two most famous works, Carroll leased “The Chestnuts” in Guildford in 1868 to serve as a home for his sisters. 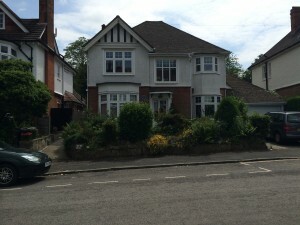 The house sits at the end of Castle Hill Road adjacent to the Guildford Castle, which is as good a landmark as any to serve as the center of town. Carroll visited The Chestnuts on many occasions over the rest of his life; it was his home away from Christ Church home. He died there 30 years later and was buried at the Guildford Mount Cemetery. Who knows whether Turing was aware that Carroll, whose two Alice books he was reading, had had a home a mere mile from where his parents were living. The Sherborne library entry provides yet another convergence between the two British-born, Oxbridge-educated, permanent bachelors with sui generis demeanors, questioned sexualities, and occasional stammers, interested in logic and mathematics. But there’s more. What of the third book that Turing checked out of the Sherborne library at the same time? 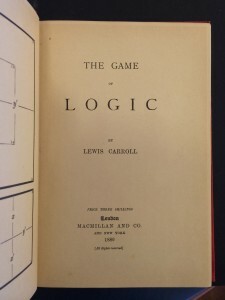 Leavitt finds the third book remarkable because the title, The Game of Logic, presages Turing’s later work in logic and the foundations of computer science. What Leavitt doesn’t seem to be aware of is that it is no surprise that this book would accompany the Alice books; it has the same author. Carroll published The Game of Logic in 1886. It serves to make what I believe to be the deepest connection between the two mathematicians, one that has to my knowledge never been noted before. 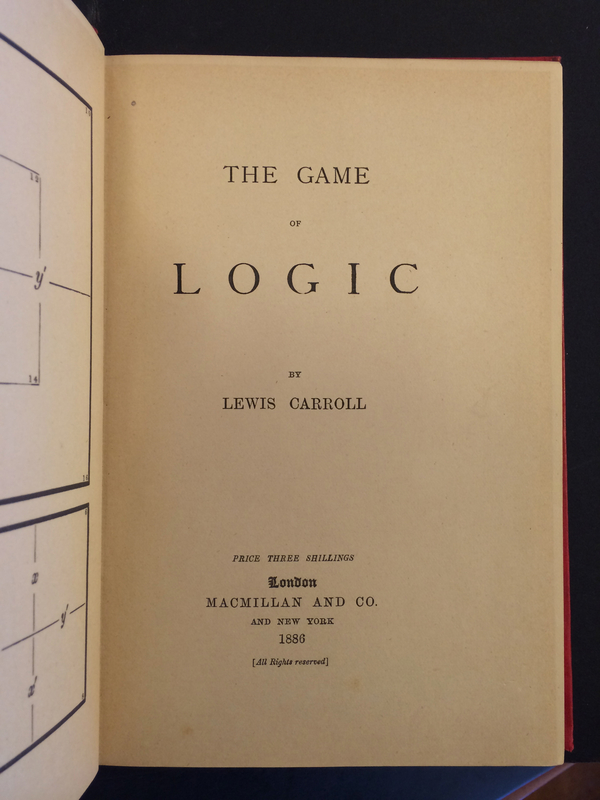 Title page of Lewis Carroll, The Game of Logic, 1886. EC85.D6645.886g, Houghton Library, Harvard University. After watching Codebreaker and noting the Game of Logic connection, I decided to refresh my memory about the book. I visited Harvard’s Houghton Library, which happens to have Carroll’s own copy of the book. The title page is shown at right, with the facing page visible showing a sample card to be used in the game. The book was sold together with a copy of the card made of pasteboard and counters of two colors (red and grey) to be used to mark the squares on the card. The Houghton visit and the handling of the game pieces jogged my memory as to the point of Carroll’s book. Carroll’s goal in The Game of Logic was to describe a system for carrying out syllogistic reasoning that even a child could master. Towards that goal, the system was intended to be completely mechanical. It involved the card marked off in squares and the two types of counters placed on the card in various configurations. Any of a large class of syllogisms over arbitrary properties can be characterized in this way, given a large enough card and enough counters, though it becomes unwieldy quite quickly after just a few. The game card depicting a syllogism. Lewis Carroll, The Game of Logic, 1886. EC85.D6645.886g, Houghton Library, Harvard University. No red apples are unripe. Some wholesome apples are red. To computer scientists, this ought to sound familiar. Just six years after checking out The Game of Logic from his school library, Turing would publish his groundbreaking paper “On computable numbers”, in which he describes a system for carrying out computations in a way that is completely mechanical. It involves a paper tape marked off in squares, and markings of at least two types placed on the tape in various configurations. Any of a large class of computations over arbitrary values can be characterized in this way, given a large enough tape and enough markings, though it becomes unwieldy quite quickly. We now call this mechanical device with tape and markings a Turing machine, and recognize it as the first universal model of computation. Turing’s paper serves as the premier work in the then nascent field of computer science. Of course, there are differences both superficial and fundamental between Carroll’s game and Turing’s machine. Carroll’s card is two-dimensional with squares marked off in a lattice pattern, and counters are placed both within the squares and on the edges between squares. Turing’s tape is one-dimensional (though two-dimensional Turing machines have been defined and analyzed) and the markings are placed only within the squares. Most importantly, nothing even approaching the ramifications that Turing developed on the basis of his model came from Carroll’s simple game. (As a mathematician, Carroll was no Turing.) Nonetheless, in a sense the book that Turing read at 17 attempts to do for logic what Turing achieved six years later for computation. 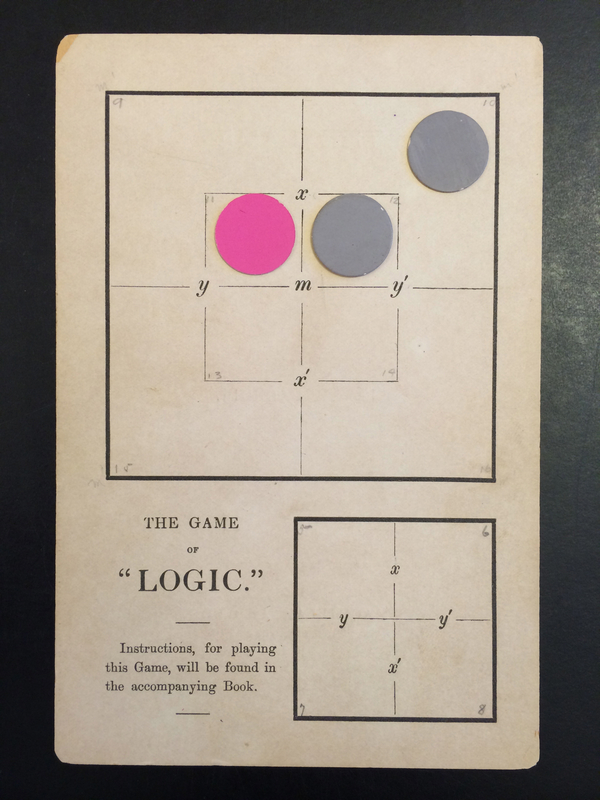 I have no idea whether Lewis Carroll’s The Game of Logic influenced Alan Turing’s thinking about computability. 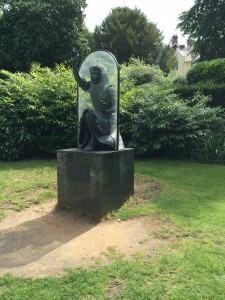 But it serves as perhaps the strongest conceptual bond between Guildford’s two great mathematicians. Update February 25, 2015: Thanks to Houghton Library Blog for reblogging this post.